Some fabrics just aren’t suitable for certain models. But it is not always easy to see such incompatibility when looking through swatches on the showroom floor. In our time we’ve seen questionable upholstery choices result in some unfortunate arrangements and unhappy end-users. Fabrics behave differently depending on the composition, weave and structure and after nearly 50 years in the business, we have a pretty good idea of what works on a particular style. That’s why talking through fabric suitability with both the furniture manufacturer and the fabric wholesaler is so important. At the forefront of many upholstery decisions is durability. While rub tests are a useful reference point for a fabric’s abrasive resistance, they certainly don’t provide the last word. It’s imperative to also understand the implications of a fabric’s physical and aesthetic properties when specifying a covering. Looking at the weave and structure of a fabric is a good place to start. Hold it up to the light to see how it’s built. If it’s not woven well seam slippage can occur — like a too-tight pair of jeans that start to open at the seams. Knowledge of the various yarns, the behaviour of different blends and how different constructions sit is essential to ensuring long term performance. Cotton provides strength and resistance to wear while viscose lends a soft, silky feel. Knits can work well but they will stretch. Linen looks beautiful on soft pieces but can’t be used in tight upholstery. It’s all about knowing how these qualities will play out on a particular design. While a finely constructed fabric may tick the right boxes for composition, it needs a certain amount of body to maintain a firm, tidy appearance. A tightly constructed fabric with substance will generally sit better and retain stability over time. The style of the settee or chair must also be carefully considered. A piece with a fixed seat and back only suits certain fabric compositions because of the foam used and upholstery methods required. Linens look fantastic on a relaxed piece or a tightly upholstered frame with a loose seat. However on a fixed seat design, linen will stretch and puddle over time as will fabrics with a high viscose content. Generally, when a design requires tight upholstery, a firmer fabric is more appropriate because it secures points of tension. A factor often ignored is the intended use of a piece. 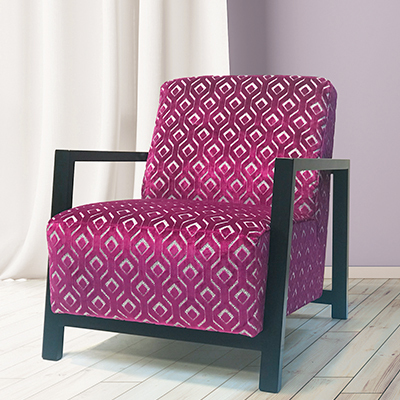 While colour tends to be the single biggest factor in picking an upholstery fabric, a discussion around suitability must happen to avoid dissatisfaction later on. So here are some questions to consider when assessing fabric suitability. What’s in store for your furniture? One careful lady owner or a hoard of boisterous teenagers? Does it need to hold up to a bit of rough and tumble? How much time will it spend in sunlight each day? How long will the fabric last before reupholstering is necessary? Are there particular limitations with fabrics? Is there an awareness of the care and maintenance required? 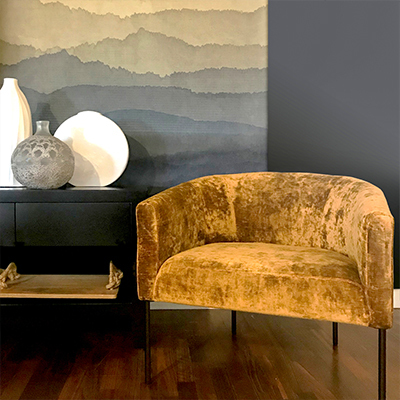 For example, velvet is currently experiencing a strong revival but can be constructed from a variety of different blends. This means the properties of velvet can be vastly different. For more guidance, see James Dunlop’s article on how to handle and care for velvets. Just as a bed has to be made each day, couches with soft or loose cushioning require ‘redressing’ to reset the foam in place. Poorly dressed seats and backs can lead to foam getting crushed and losing its memory. Does the design suit the lifestyle? If a fine fabric is chosen will it be ok if there is a little wrinkling or creasing? Or is a tight, crease-free look preferred? If so, will the cushions need ‘redressing’ each day? With colour and texture options widening each year and new blends constantly appearing in wholesaler catalogues, a specifier really has to know their stuff. The time spent here is worth it however – it can ensure the design is preserved, adding years to the lifespan of a piece.